Smoking Skull Fogger. 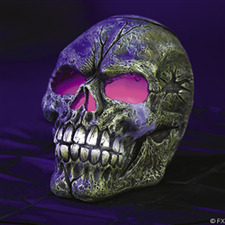 Cast an eerie glow on your haunted swamp with this smoking skull fogger! This 7" resin skull uses regular tap water to create color-changing fog! Every haunted house or backyard bog needs a smoky skeleton head to complete the décor. With AC adaptor and on/off switch. UL listed. Includes instructions.